WilliamThackeray is a Legacy Library. Legacy libraries are the personal libraries of famous readers, entered by LibraryThing members from the Legacy Libraries group. » William Makepeace Thackeray's catalog. » William Makepeace Thackeray's legacy profile. WilliamThackeray is also an author. 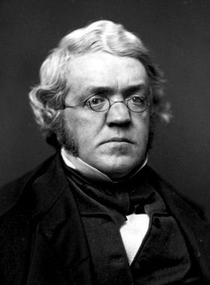 » See William Makepeace Thackeray's author page. About meWilliam Makepeace Thackeray (18 July 1811 – 24 December 1863) was an English writer and novelist of the 19th century. Hailed as the equal of Charles Dickens, and an accomplished satirist, he is best known for his novel Vanity Fair. About my libraryWilliam Makepeace Thackeray's library, upon his death, was situated at 2 Palace Green, Kensington, London. Thackeray's library contained periodicals for which he was editor, bound together in volumes, and books in European languages. Also among his collection were several presentation copies gifted from his peers including Charles Dickens and Charlotte Brontë. Little detail is given of these publications or of the marginalia written out by Thackeray within the volumes, a trait he was well known for. Source: The details for William Thackeray's library were reconstructed from the auction catalogue of the sale of his books in March, 1864. The auction consisted of 391 identified works, 202 unidentified volumes, alongside large parcels of French and German novels, large parcels of magazines, and several volumes of travel guides. Thackeray's books are not currently held by any library or academic institution though several works were discovered throughout the course of this legacy library within rare book catalogues, identified by a single provenance mark, Thackeray's small oval embossed stamp containing his initials, "W M T".